Tumbling by Caela Carter. Grades 7+. Viking. June, 2016. 432 pages. Review copy provided by publisher. There's the gymnast who hasn't played along with the Olympic coach's master plan. There's the gymnast who would rather be anywhere than at the Olympic trials. There's the gymnast who isn't eating anything. There's the gymnast who doesn't think she has a chance. There's the gymnast carrying a secret. For these five girls, the next two days are a pivotal point in their lives. It's the Olympic trials, an intense last gymnastics meet that will decide the American Olympics team. Dreams will be realized. Dreams will be crushed. Mind games will be played. Secrets will be spilled. Friends will be betrayed. Decisions will be made. And at the end of it, there will be an Olympic team. A handful of girls who will go on to compete for gold and glory. This behind-the-scenes look at the Olympic trials is a great choice for anyone who's waiting eagerly for the Olympics to start back up in August. I am definitely one of those people who can't wait for the Olympics in August, so this was right up my alley. I don't have the experience to know for sure, but the book seems very well researched, including lots of details of the minutiae of gymnastics life. A lengthy glossary includes lots of gymnastic terms. Besides being a solid sports book, this is a great book for teens who enjoy the ~drama~ of it all. Any sport has psychological aspects to it. Combine that with a gaggle of teenage girls, all thirsty for a chance at their Olympic dreams, and you get quite the soap opera (in a good way, I mean). The cast of narrators is diverse in a surface-level way (there's the African American, the Jewish girl, the half-Asian girl, the closeted lesbian), but the focus here is on the sport and the relationships of the characters to one another and to their own goals. For younger teens looking for more gymnastics this summer, try Gold Medal Summer by Donna Freitas (Arthur A. Levine, 2012). 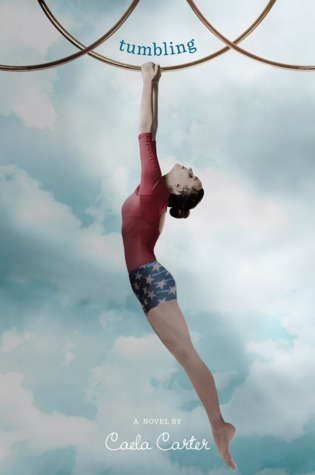 Older teens might enjoy gymnastics memoirs like Off Balance by Dominique Moceanu (Touchstone, 2012). Readers who gravitate toward the drama between the girls might like Tiny Pretty Things by Sona Charaipotra and Dhonielle Clayton (HarperTeen, 2015). Readers may also enjoy dance stories like Up to This Pointe by Jennifer Longo (Random, 2016) or Pointe by Brandy Colbert (Penguin, 2014).